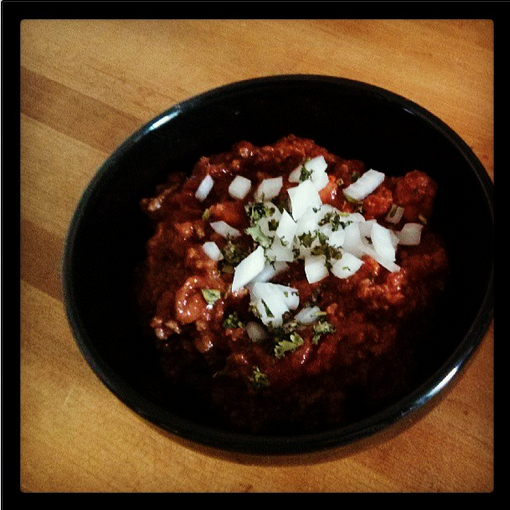 I’ve been working on my chili recipe for years, decades even…I think I finally have it as good as I can get it! Enjoy! 1) Heat the butter and bacon fat in a large heavy pot over high heat. Add the onions and sauté’ a few minutes until they start to soften, cover the pan, and continue cooking on low heat until the onions caramelize. They will look golden color and be very sweet. When they are done, remove the onions from he pan with a slotted spoon, leaving as much of the liquid as possible. 2) Add more butter and bacon fat and brown the hamburger in batches until cooked through about 2/3 of the way, still showing a bit of pink. Add the seasonings, onions, sautéing about 10 minutes until the spices are very aromatic. about 10 minutes. 2) Add the tomatoes, tomato paste, salt, brown sugar, and chocolate to the pot. Stir well and bring to a boil. Reduce to a simmer and cook until slightly thickened, about 1 hour, stirring occasionally to prevent the chili from sticking to the bottom of the pot. 3) Skim off as much fat as possible. Add the beans, return to a simmer, cover, and cook until thickened, about 1 1/2 hours longer. Serve with the diced onions, and cilantro alongside as garnish.